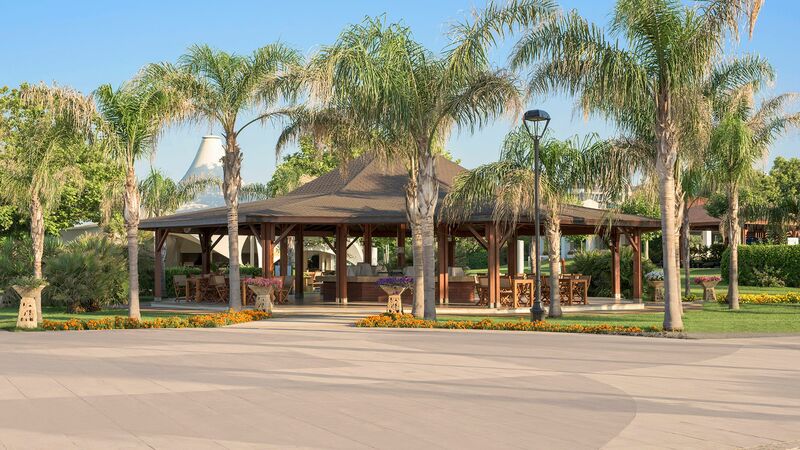 The Ela Quality Resort enjoys an enviable position on Belek’s golden sandy beach, surrounded by lush pine forests and ideal for families and couples. 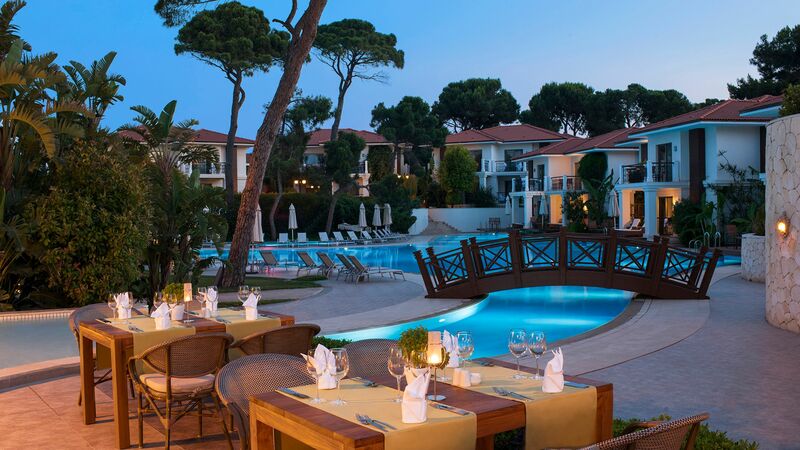 Guests can relax in Ottoman-style palatial accommodation with opulent décor and a wealth of facilities. Select from an array of mouth watering restaurants serving Japanese, Ottoman, Italian, French and Mexican cuisine in exquisite settings. Rejuvenate in the deluxe Ab-I Zen Spa while the children have their own fun in the Everland Q Kids Club. There are also separate children’s swimming pools and family-friendly dining. Choose from sea view rooms, villas and suites that are both modern and comfortable with elegant, neutral décor finished with dark wood furniture. A comprehensive all inclusive concept is available, with unique features to help you create your very own oasis of luxury. Guests can also enjoy a wealth of leisure activities; from water sports to yoga and cooking courses. Hotel child prices apply to children aged 2–11 years. All meals (excluding meals at the Teppanyaki restaurant which are charged according to the menu price; a reservation fee is payable for all à la carte restaurants). Snacks. Ice cream. 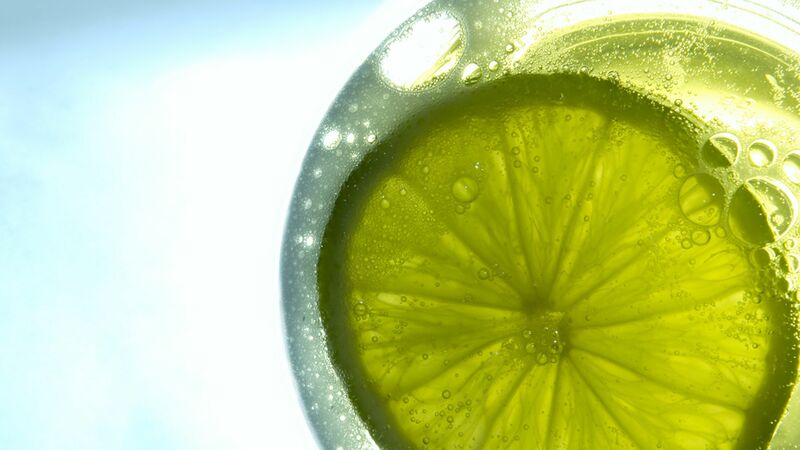 Selected local and imported alcoholic and non-alcoholic drinks. Minibar soft drinks and beer. Room service from a special menu between 2am - 7am (at all other times room service is available at a charge). Selected sports and activities. Sauna, Turkish bath, steam bath and relaxation area. Evening entertainment. The palatial lobby bar offers soothing piano and harp music and serves alcoholic and non-alcoholic beverages including its signature traditional lemonade. 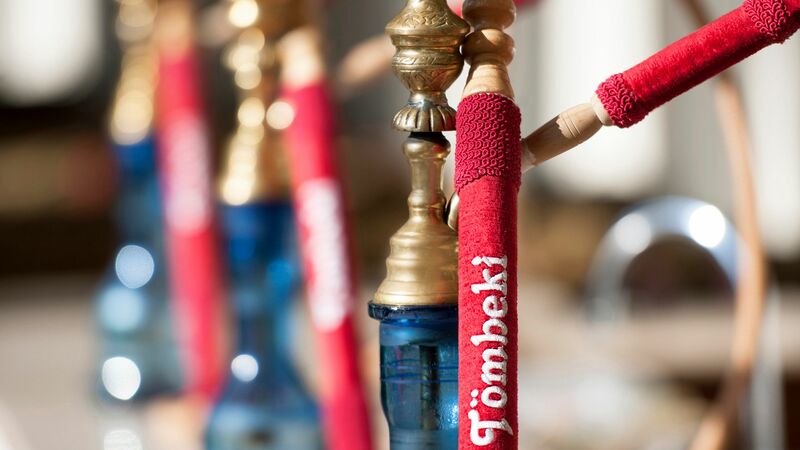 Indulge in a slice of Turkish culture on the terrace overlooking the gardens with traditional shisha or a strong Turkish coffee or tea. 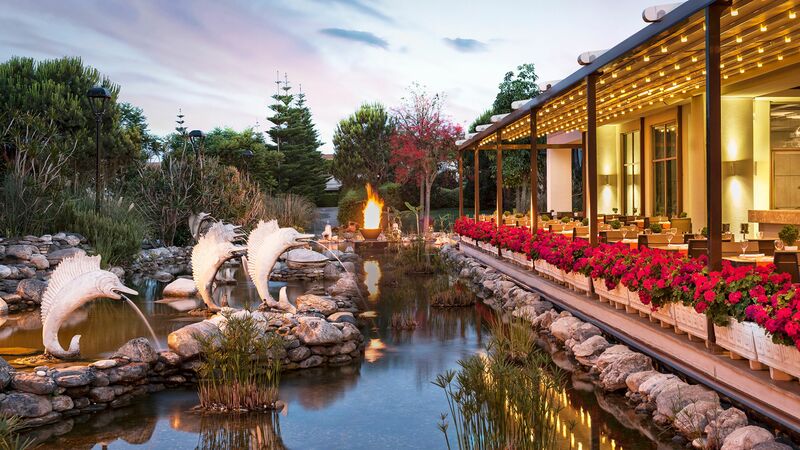 Enjoy al fresco a la carte dining featuring Japanese cuisine served from six hot tables. Watch talented chefs create an artistic Japanese masterpiece before your eyes in an exciting Teppanyaki show. Indulge in a culinary journey featuring Turkish and international cuisine displayed in a beautiful buffet, within an artistically designed restaurant overlooking the gardens. Open for breakfast, lunch, dinner and evening snacks, this extensive buffet also caters for children, diabetics and special diets. Open: 07:00 – 11:00, 12:30 – 14:30, 19:00 – 21:30 and 23:30 – 02:00. 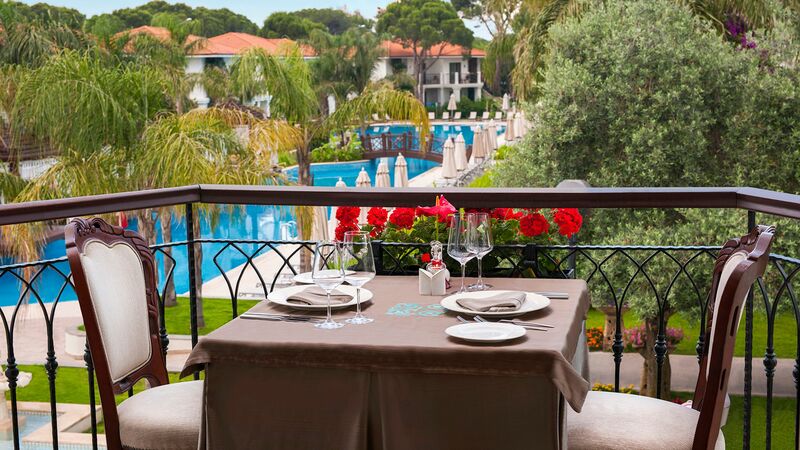 Overlooking the pool and gardens, guests can enjoy an a la carte lunch featuring Turkish and international flavours transformed into an artistic banquet. Open: 12:30 – 16:00 in summer, closed in winter. La Salsa offers an authentic Mexican culinary experience where guests can enjoy al fresco dining overlooking the gardens and pool, while sampling quesadillas, nachos and fajitas. Enjoy gourmet French cuisine in a romantic setting overlooking the pool or in a sumptuous dining room, where you can devour award winning dishes accompanied by fine French wines. Children under the age or 14 are not permitted at this restaurant. 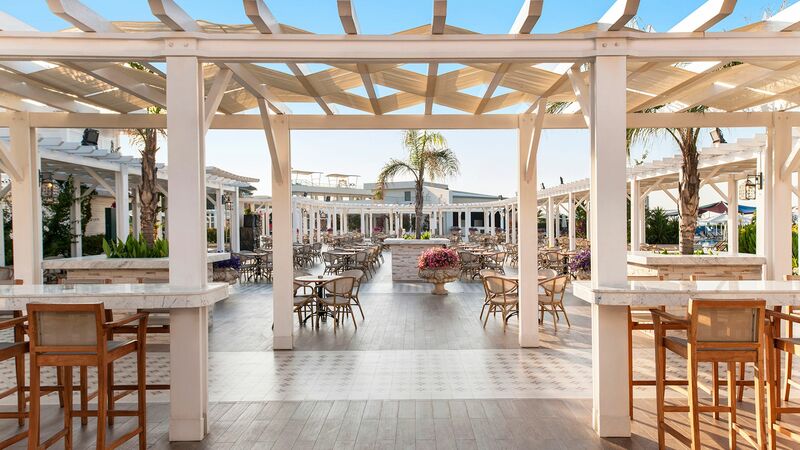 Sample light bites and snacks just steps from the beach and pool in a casual atmosphere. Open: 12:30 – 16:00 in summer, 12:00 – 16:00.
in winter served at Ab-I Lal restaurant. 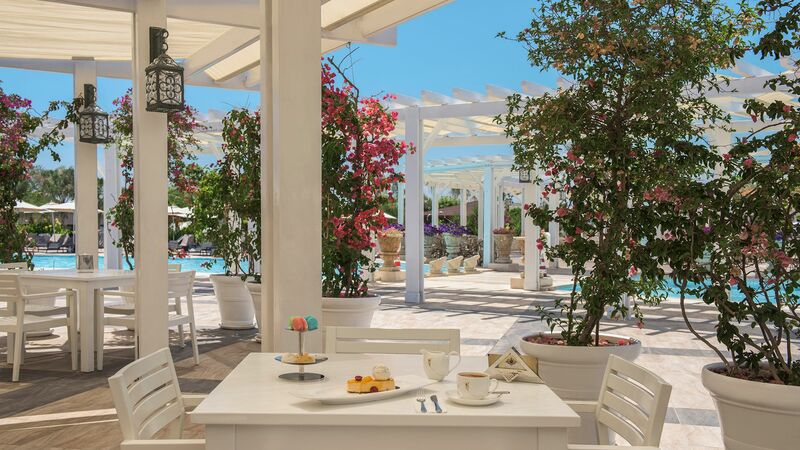 Relish in a taste of Italy as you dine al fresco style on the terrace overlooking the pool. Sample mouth watering risottos, pastas and salads accompanied by Neapolitan music. Open: 19:00 – 22:00 in summer, closed in winter. Enjoy freshly squeezed fruit and vegetable juices at the spa, exclusively for guests using the Turkish baths, indoor pool and sauna. 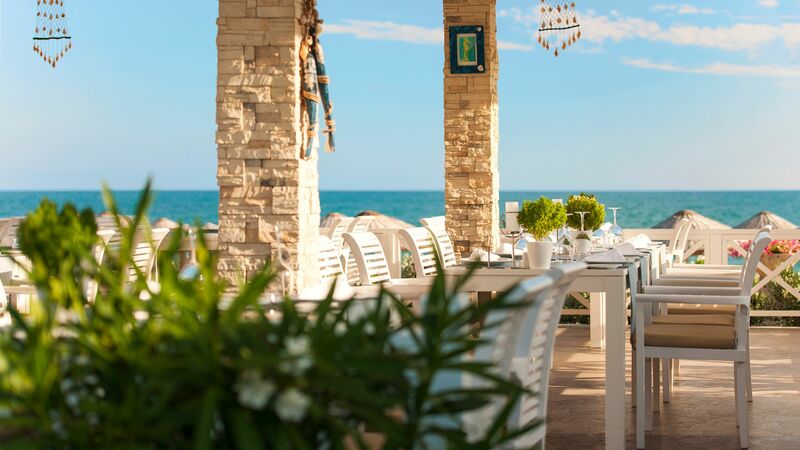 Indulge in traditional a la carte Turkish dishes, fresh seafood and Mediterranean cuisine as you dine al fresco, overlooking the sea. 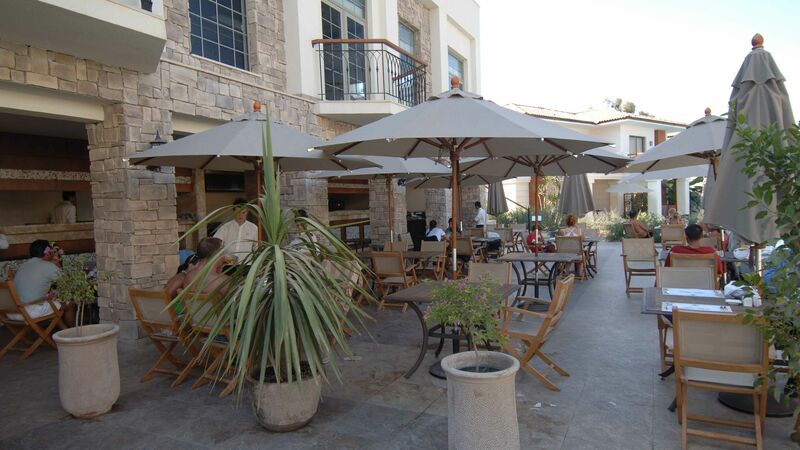 Sit under the shady canopy and cool off as you enjoy fast food Turkish-style. Choose from Turkish pancakes, pasties and pizzas just minutes from the beach. Open: 11:00 – 18:00 in summer, closed in winter. 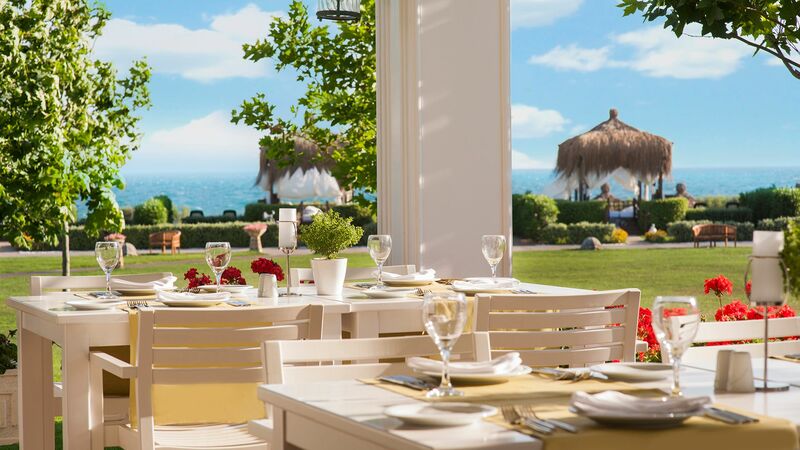 Relish in a taste of the Aegean as you dine on fresh and healthy ingredients inspired by Kalamata cuisine on the terrace overlooking the sea and gardens. Sip signature cocktails or refreshing mocktails next to the main swimming pool, al fresco style. As night falls, enjoy the live music, dance and DJs. Open: 10:00 – 00:00 in summer, closed in winter. 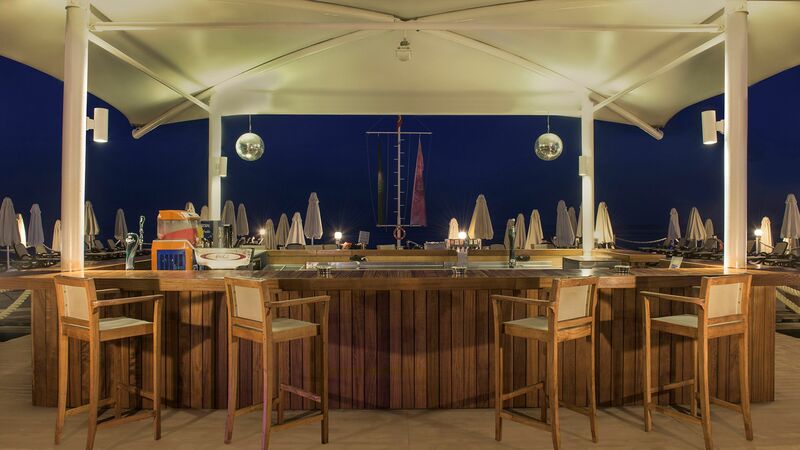 Cool off with a beer or soft drink in this relaxing bar, which is just a few steps from the beach. Open: 10:00 – 18:00 in summer, closed in winter. Sit at the end of the pier overlooking the water with a refreshing non-alcoholic cool drink. Guests can also enjoy weekly Pool Parties, DJs, live music and sound and light shows. 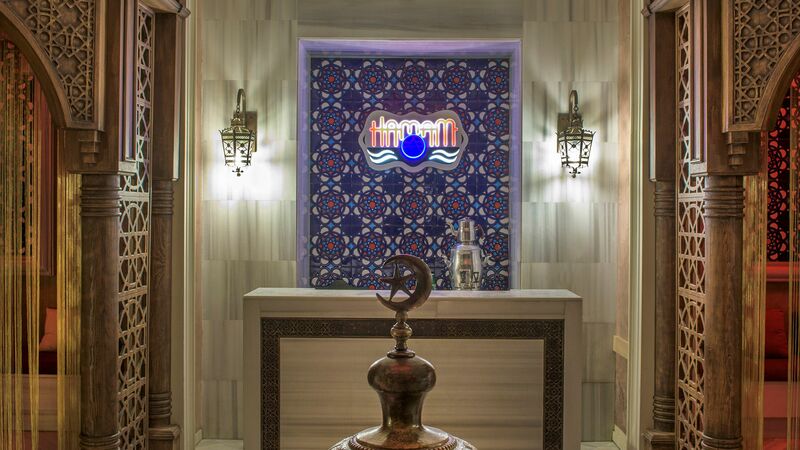 Located in the Spa, this relaxing bar area serves mineral water and teas for guests who have used the Turkish baths. 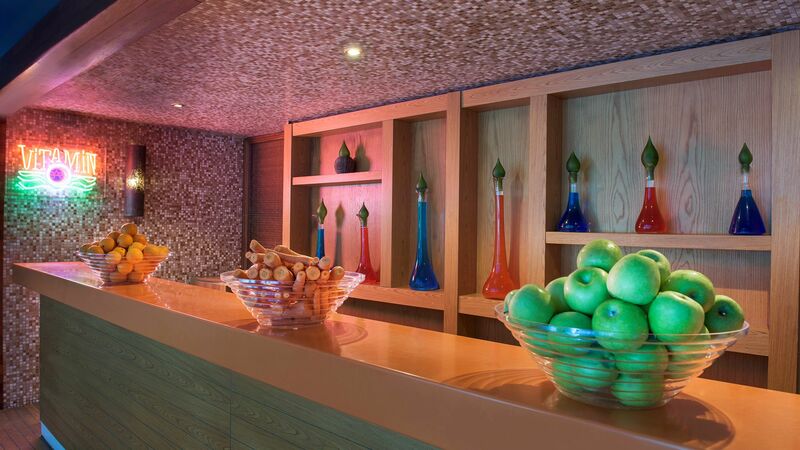 Choose from a menu of herbal teas or fruit and vegetable juices in relaxing surroundings within the Ab-Zen Spa & Rituals Lounge after a rejuvenating massage or treatment in the spa centre. 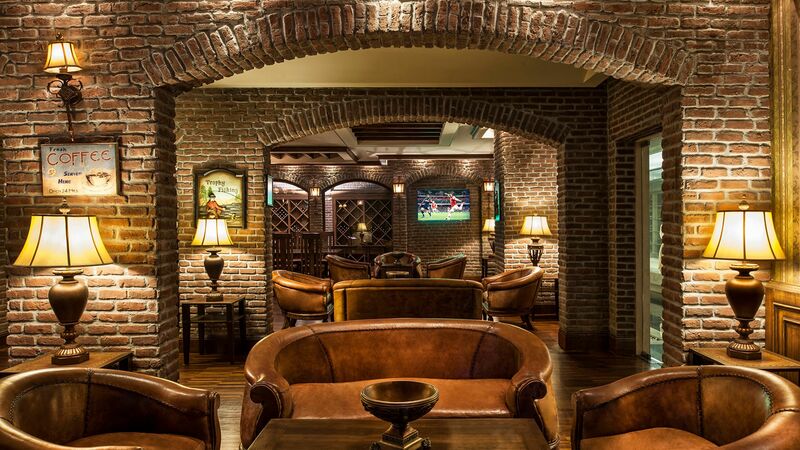 This Irish themed pub features live music and sport, accompanied by a fine collection of Irish whiskies, cognacs and fine wine. Open: 16:00 – 00:00 (10:00 – 00:00 during winter). Relax on 270 metres of private golden sands or take a stroll along the pier as you look out to the azure waters of the Mediterranean. Take a dip in the 6,500 square metre freshwater swimming pool, which comes complete with nine water slides. Alternatively, there are two indoor swimming pools, with a dedicated pool for children. The Everland Q Baby Room caters for 1 – 3 year olds looked after by specially trained staff. Sleeping and activity rooms are available, alongside changing facilities and baby food preparation area. Babysitting can be arranged at an additional cost. Ages: 1 to 3 years. Open: 10:00 – 12:30, 14:30 – 18:00 and 20:00 – 23:00 April to October. 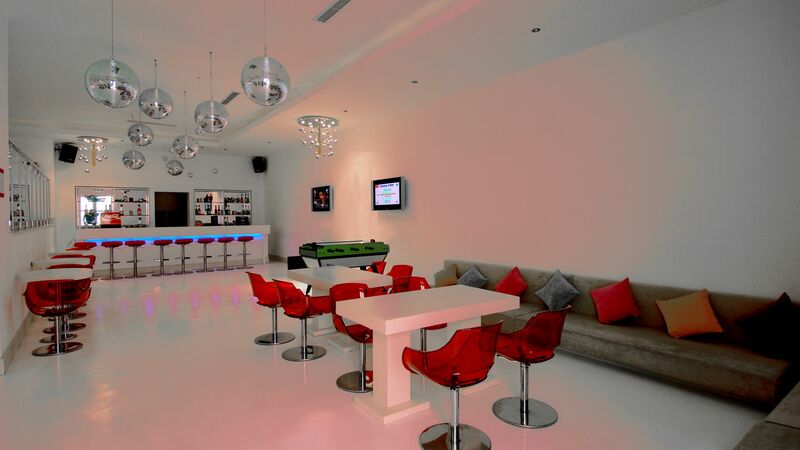 Exclusively for 13-17 year olds, Barteen offers an adult-free zone complete with computer games, billiards and DJ courses. Ages: 13 to 17 years. Younger guests can enjoy their very own lunch and dinner buffet of their favourite things, complete with kids’ size tables and chairs. Open: 12:00 – 14:00, 15:30 – 16:30 and 18:00 – 20:00. 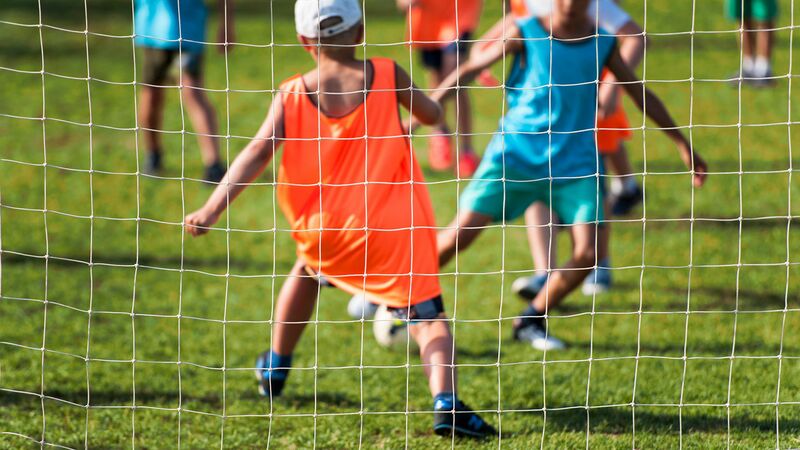 A specialist programme of fun and education aimed at 3 to 6 year olds (Mini Club) and 7 to 12 year olds (Maxi Club) under the supervision of childcare specialists. 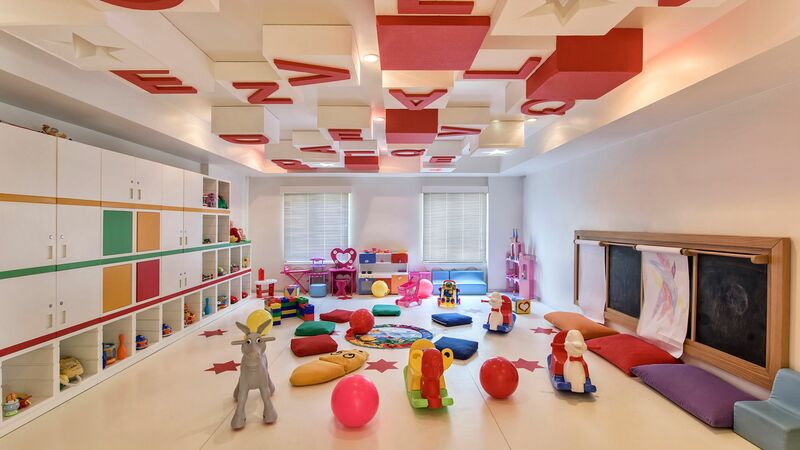 Children can enjoy a playroom, cinema, mini disco and dinosaur excavation area. Ages: 3 to 6 years (Mini Club) and 7 to 12 years (Maxi Club). Part of the Everland Q, the Barteen is designed specifically for teenagers aged 13 - 17 years, serving chilled non-alcoholic drinks accompanied by fun activities including DJ courses, billiards, computer games and more. Relax in this 4,500 square metre oasis of tranquillity and calm amidst stylish architecture, which features traditional Hamman, massages, therapies, facials and Turkish baths. 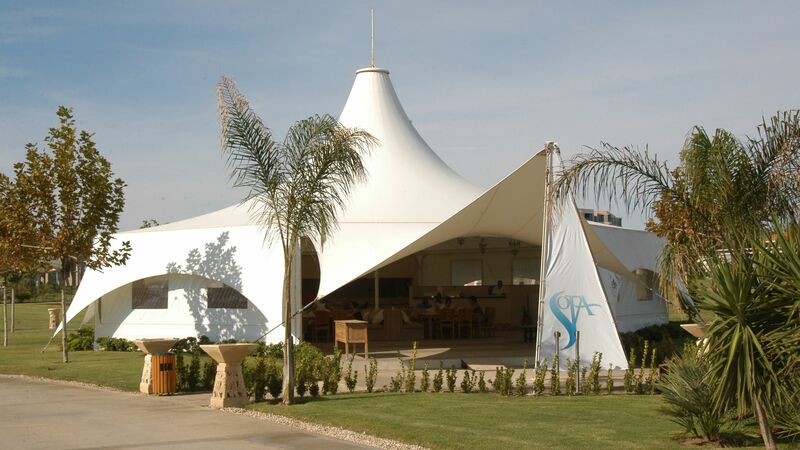 Children are welcome at the spa and specialist family treatments are available. The choice of activities at Ela Quality is endless. 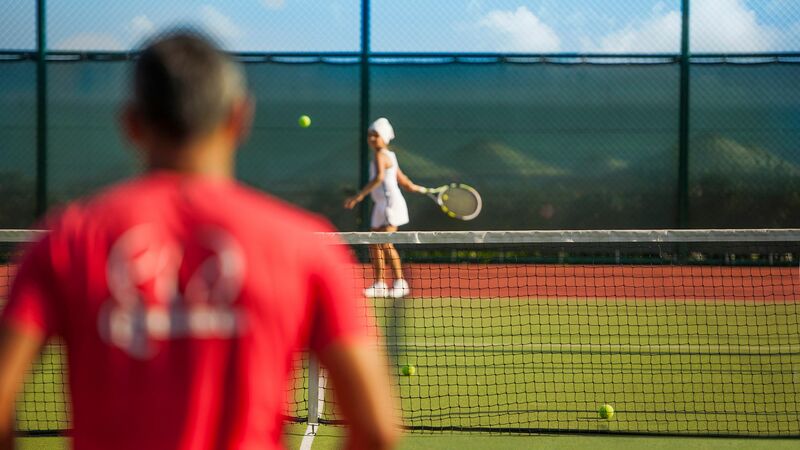 From watersports, basketball, tennis and beach volley to yoga and cooking courses. Stay active with aerobics, zumba, pilates, aqua aerobics and many other exercise classes, learn new skills with yoga, dance and cooking classes or have fun with segway, bowling, billiards, mini golf or table tennis. Children can join in the fun too and try trampolining or the aqua park with waterslides. For those who enjoy a round of golf, Ela Quality Resort is the perfect destination. Located right in the middle of the Belek golf centre, there is a large variety of high class golf courses, all within 10 - 15 minutes drive. Please note not all facilities are complimentary. After the sun sets behind the horizon, the nightlife takes over. Put on your dancing shoes and head to the fabulous weekly 'Pier Parties' then continue to dance the night away at the 'Heat on South' disco. Those who are after a spot of culture can enjoy the regular amphitheatre shows as well as outdoor and indoor cinema screenings and live music and dance performances. 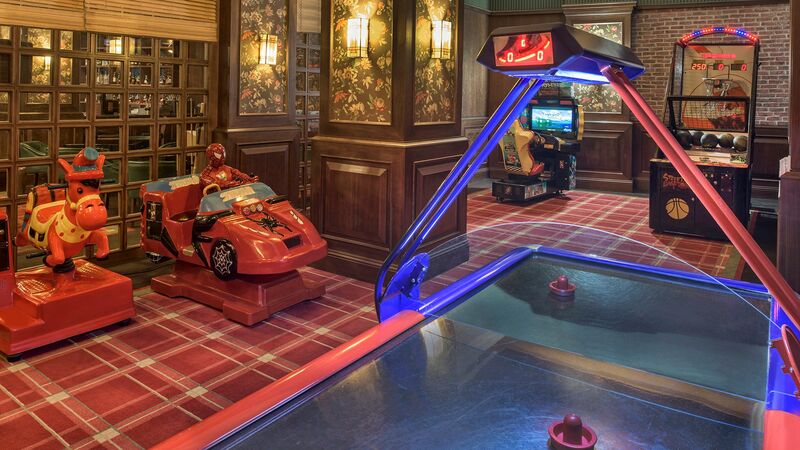 And if sleep isn't on the agenda, the 24-hour Game Zone bar will keep you going till morning with table games, billiards and more. A 24 hour bar featuring bowling, billiards, playing tables and machines is located opposite the 'Heat on South' disco and next to a cinema. 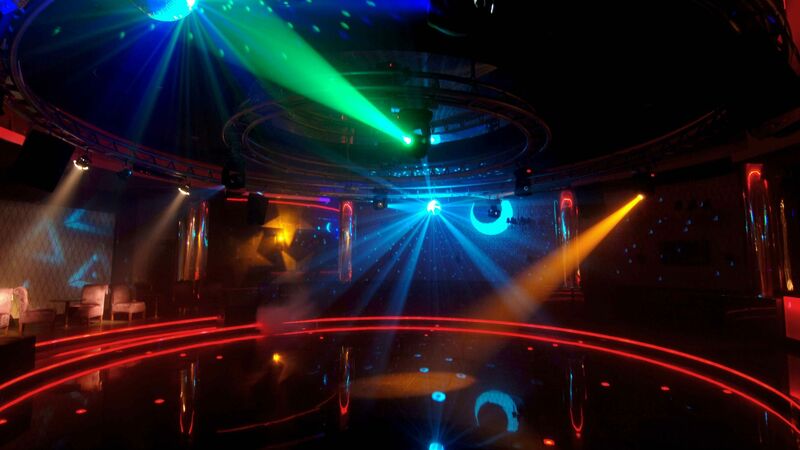 Enjoy the music and dance at this night club with quality sound and lighting system and great DJ performances. 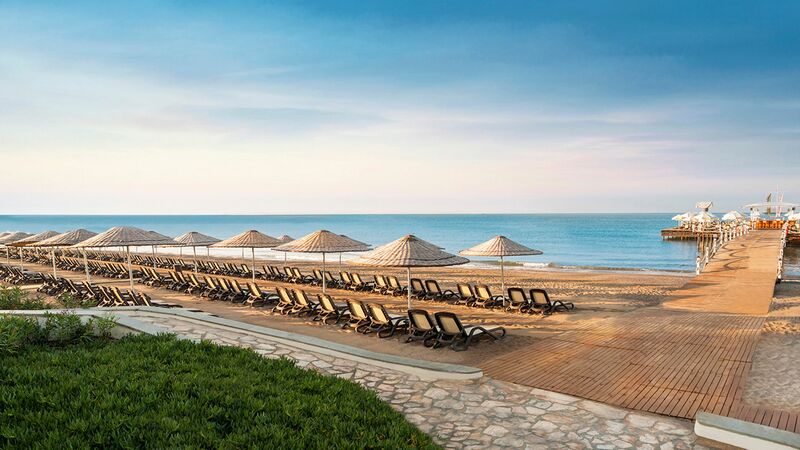 Nestled on the sun-kissed Turkish Riviera, Belek offers an impressive king size beach of golden sands, edged with warm, shallow waters perfect for swimming, snorkelling and paddling. A fine collection of water sports await, while up from the beach chic hotels and restaurants line the promenade. Beyond the beach are an impressive selection of golf courses, including eight golf courses in Belek, plus two 27-hole greens where top golfers have played. For a slice of Turkish tradition and culture, visit the weekly bazaar and sample the cafés and little shops dotted throughout the town. History lovers will enjoy wandering among the city walls, or taking an excursion out to the Roman amphitheatre of Aspendos and the ancient city of Perge. 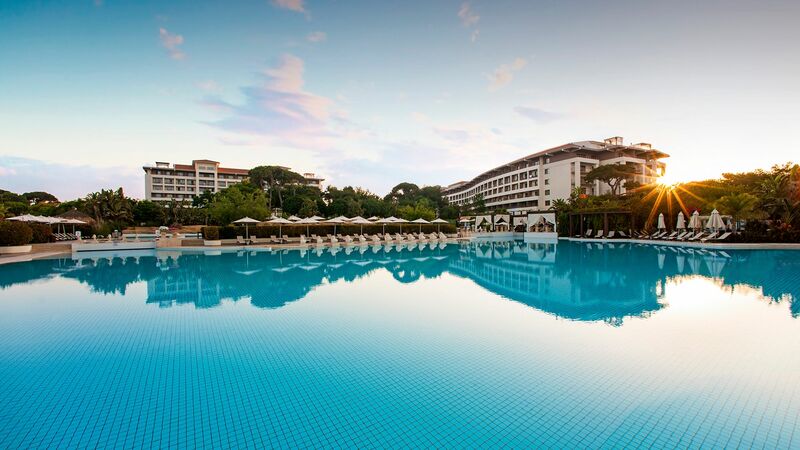 Ela Quality Resort Belek is 30 minutes from Antalya Airport. Main Building Standard Land View Rooms have french or twin beds, air conditioning, satellite TV with a variety of English speaking channels (including children's channels), internet access, telephone, minibar, safe, bathtub, bathrobes, slippers and a balcony. They also feature mini bathrobes and mini slippers for children as well as children's bathroom amenities. The extra bed type is a sofa bed or a roll-away bed. Main Building Sea View Rooms have french or twin beds, air conditioning, satellite TV with a variety of English speaking channels (including children's channels), internet access, telephone, minibar, safe, bathtub, bathrobes, slippers and a balcony. They also feature mini bathrobes and mini slippers for children as well as children's bathroom amenities. In addition these rooms offer lovely sea views. The extra bed type is a sofa bed or a roll-away bed. Main Building Standard Sea View Room with Jacuzzi have french or twin beds, air conditioning, satellite TV with a variety of English speaking channels (including children's channels), internet access, telephone, minibar, safe, bathtub, bathrobes, slippers and a balcony. They also feature mini bathrobes and mini slippers for children as well as children's bathroom amenities. In addition these rooms offer lovely sea views. The extra bed type is a sofa bed or a roll-away bed. Family Duplex Rooms are located in the main building and have a bedroom with twin beds, sitting area, bathroom with bathtub and balcony on the ground floor, and a bedroom with a french bed and bathroom on the first floor. This room has an open-plan layout, but there is a child security gate at the stairs. The Duplex rooms offer the same facilities as the main building rooms. Family Duplex Rooms are located in the main building and have a bedroom with twin beds, sitting area, bathroom with bathtub and balcony on the ground floor, and a bedroom with a french bed and bathroom on the first floor. This room has an open-plan layout, but there is a child security gate at the stairs. The Duplex rooms offer the same facilities as the main building rooms. In addition, they offer lovely views towards the sea. Lake House rooms are located away from the main hotel in small two or three storey buildings. They feature twin beds, balcony with garden views, air conditioning, satellite TV with a variety of English speaking channels (including children's channels), internet access, telephone, minibar, safe, bathtub, bathrobes and slippers. They also feature mini bathrobes and mini slippers for children as well as children's bathroom amenities. The extra bed type is a roll-away bed or a sofa bed. Lake House rooms are located away from the main hotel in small two or three storey buildings. They feature french bed, balcony with pool views, air conditioning, satellite TV with a variety of English speaking channels (including children's channels), internet access, telephone, minibar, safe, bathtub, bathrobes and slippers. They also feature mini bathrobes and mini slippers for children as well as children's bathroom amenities. The extra bed type is a roll-away bed or a sofa bed. Lake House Family Pool View rooms are located away from the main hotel in small two or three storey buildings. They feature french bed, balcony with pool views, air conditioning, satellite TV with a variety of English speaking channels (including children's channels), internet access, telephone, minibar, safe, bathtub, bathrobes and slippers. They also feature mini bathrobes and mini slippers for children as well as children's bathroom amenities. The extra bed type is a roll-away bed or a sofa bed. Lake Houses with Pier are located on the ground floor and have a private pier leading directly to a swimming pool. Please note, Sovereign does not accept children in this room category. Lake House Suites are situated on the ground or first floor. All Lake House Suites have carpeted floors and have a balcony or terrace. Lake House Suites on the ground floor have a living room and one bedroom. Lake House Suites on the first floor have one bedroom with French bed and one bedroom with twin bed. Deluxe Suites feature a bedroom with french bed, separate living room with sofa bed, bathroom with Jacuzzi® bath, separate shower and a toilet plus an additional separate toilet in the hallway, 2 Satellite TVs, 2 minibars and a large balcony. The extra bed types are two single sofa beds. Save up to 15% discount on the hotel price for holidays between 01 April - 03 June 2019 and 30 June - 31 October 2019, booked by 30 April 2019. Sovereign guests will receive complimentary fruit and wine in the room on arrival, a 10% discount on treatments in the hotel spa and an Ela teddy bear for each child aged 0-12. “ Absolutely fab for adults and children. I stayed with my family at the start of April 2019. We stayed in one of the Prestige Suites which allowed us to eat in the a'la carte restaurants most nights, every single one of them I'd recommend. The room was enormous, over two floors with an outside hot tub, fully stocked mini bar and spotless rooms. Staff were brilliant to our family and nothing seemed too much trouble for either waiting staff or guest relations. Would recommend the Turkish baths, a little pricey but worth it. Breakfast was quiet but don't expect a full english (thankfully!) Don't have any negative points about this hotel. A small tip / gratuity to waiting staff goes a long way. We stayed as a family of 4 in April from the 11th to the 18th. Overall we had a great stay, very relaxing and peaceful. The staff were all very friendly and were very efficient and pleasant at doing their job. We never had any problems with English being understood and the hotel caters for a wide range of nationalities very well. The food was very good. We mainly ate in the main buffet for dinner and there was lots of variety and everything was very fresh and tasty. Per usual in this part of the world the deserts were a bit hit and miss. The negatives for out stay. - Air con wasn't turned on in the rooms thus even with a fan from reception it was very stuffy. The hotel suggest air con will be on next week. - A number of the hotel amenities advertised (pier/fish restaurant/cabanas) weren't open and were only just being renovated. This shouldn't be an issue for guests from May onwards. Overall this hotel and the all inclusive quality have restored our faith in this part of Turkey and we would most definitely return. Room was good. The food was excellent. The Italian restaurant a la carte a good service and friendly. The pool was very big. The coctails are delicious. Also they have gym but just a advice we wait yesterday at 17:00 for pilates but in animation person,they didnt come. Our room was big, clean and very comfortable, the view from our balcony was of trees and bush, it felt like you were the only people staying there, very relaxing. We ate breakfast in the restaurant each morning, the food and service was excellent. We had dinner in the main restaurant and once again the food and staff were excellent. The view from the restaurant terrace is of the bush land and gives a very peaceful, relaxing outlook. Every staff member we came across, had a smile and nothing was too much trouble, even the cleaners. It is a very well run hotel and staff look like they enjoy working there... (I would like to thank Mr. Tolga our highest gratitude and appreciation we are so grateful for your support) We will definitely be back.